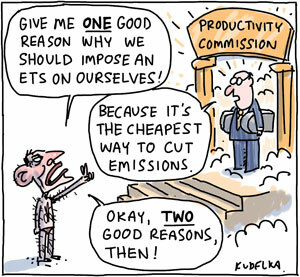 In the fight to the death that preventing the ETS has become, Tony is now in the awkward position of essentially having to deny that the market is the best way to effect human behavioural change, which is a tricky sell when you’re trying to position your party as the superior economic manager. It’s a bit disappointing, as an argument on the detail of how the carbon tax/ETS is going to be structured might actually yield some good ideas and be quite useful to the future of the country. I look forward to seeing if Malcolm Turnbull manages to get through this one without his head exploding.